Someday we’ll try to explain to the kids how we used to be cool. How we used to live in NYC…well, technically just outside it. Ok. It was New Jersey, but is was just across the Hudson. Mommy went to culinary school downtown after teaching preschool in Queens and daddy played bass in a rock band. After work, we used to meet up with friends in some of the city’s coolest places, like a one-time speakeasy, said to have been a favorite spot for numerous authors, poets, and playwrights, such as E.E. Cummings, William Faulkner, and Eugene O’Neill. And in the evenings we’d hang out in underground clubs, sometimes shoulder to shoulder with the likes of Chris Robinson from the Black Crowes, as a fire-breathing (literally) band called Toilet Boys rocked the stage. For realz. And one time we even bumped into a young Katie Holmes (think Dawson’s Creek era) in a very un-Dawson’s Creek type bar. We’ll reminisce about the time we took friends for drinks at the bar atop the World Trade Center. Or how we used to dine in restaurants where at least five different waiters catered to our every need as we enjoyed ten-course tasting menus (with wine-pairings, of course). Places where every member of the staff made a point to know you by name on your very first visit. Places where we could drop a mortgage payment on a meal, without concern for silly things like preschool tuition, college funds or diapers. We’ll talk of the other adventures we had. Like the summer after college that we spent living in Garmisch-Partenkirchen, Germany, waiting tables and housekeeping at a local hotel, in between jaunts to Amsterdam, Italy, and Greece, back in the days where every country had their own currency. We’ll remember the afternoons we spent hiking up the Kramer mountain and drinking big mugs of flavorful German beer in the biergarten situated halfway up the mount, as we overlooked the entire town, deciding on names for our future pets. The kids will take one look at my mom jeans and the lone gray hair (which probably won’t be so lone by then) growing in my sloppy ponytail and fully believe we’re lying to them. We will appear too old and way too uncool to have ever done such cool stuff. Our pre-digital photographs will all have faded. And our friends, the ones who could corroborate our stories, will appear as full-of-bologna as we do. It’ll become like those stories our grandparents used to tell about walking to school in tissue box shoes. The kids will assume we are exaggerating, though our memories are clear. I’d like to say that we’re overdue for a another big adventure. That my heart longs, just a bit, to go back to each of those times in our lives. And it does. But I suppose that parenthood is the grandest adventure of them all. I mean, we made little humans…three of them! Little people with bits of each of us, perfectly blended into three unique individuals. Three perfect little people who will grow to create their own exciting memories. Life’s adventures don’t get more awesome than that. Our lives now are consumed by toy trains and rubber snakes. Fancy meals are made at home or enjoyed as a family at the Spaghetti Warehouse. And the last time I bumped into a rockstar, it was my four-year-old singing Nowhere Man. But it’s ok. It’s perfect, actually. There will be plenty of time for new adventures once we’re done raising our pack of tiny humans. Our bucket list of future adventures is long. But one of the adventures on the short (more easily attainable) list, is a trip to New Orleans. It may well be our next long-weekend adventure, once the baby is weened and old enough to leave for a few days. I’ve longed for New Orleans my entire life, for reasons other than my current desire to eat and drink my way through the city. The city calls to me. I’m anxious to meet her someday (ideally during Jazzfest)! In the mean time, I like to create meals with the flavors I envision I will enjoy when I’m there. 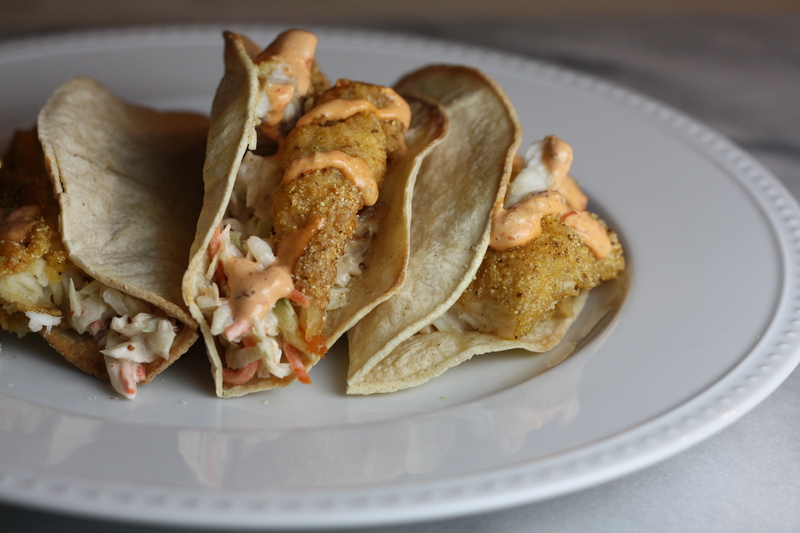 Like these Creole-style Fish Tacos, which feature big chunks of cornmeal-crusted catfish set atop a crisp creole slaw and drizzled in a spicy chipotle remoulade. P.S. 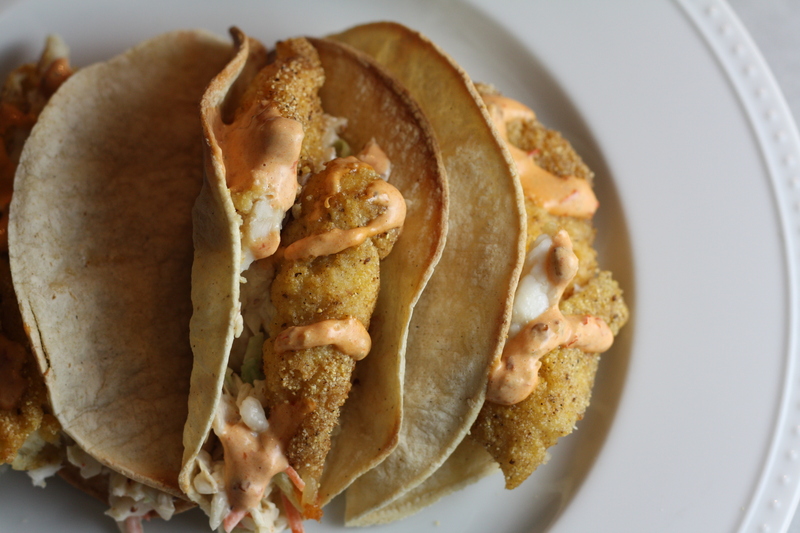 These tasty tacos are not on our South Beach diet. They were made a few weeks ago, in between mountains of Christmas cookies. But I’m sure you could squeeze them into any balanced diet! *Run your fingers along the anchovy, as you rinse it under running water to check for and remove any larger bones. If you choose to omit the anchovie, you may want to add a dash of salt to the sauce. Combine all ingredients in a blender or food processor. Blend until smooth. Taste and adjust seasonings, if desired. Refrigerate until ready to use. Combine the mayo, vinegar, worchestershire, mustard, brown sugar, garlic, cayenne and salt. Taste and adjust seasoning, if desired. Toss with the cole slaw mix. Make several hours or a day ahead if possible. Refrigerate until use. *If your creole seasoning is not well salted, add additional salt to the dry mixture. Preheat oven to 375 degrees. Combine cornmeal, flour, creole seasoning, and additional salt (optional) in a small baking dish or tray. Dip each catfish fillet into the beaten egg. Then press the catfish into the cornmeal mixture until well coated on all sides. Heat a thin layer of oil in a large oven-safe fry pan over medium/medium-high heat. Place the catfish fillets in the oil and cook for 2-3 minutes on each side, until golden and crispy. Then, place the pan into the heated oven and cook for about 12 additional minutes, until cooked through. To compose the tacos: Place 4-6 small flour tortillas in a 375 degrees oven for a few minutes, until warm and slightly toasted. Remove the tortillas from the oven and fold in half while warm. Cut the catfish fillets into large chunks. 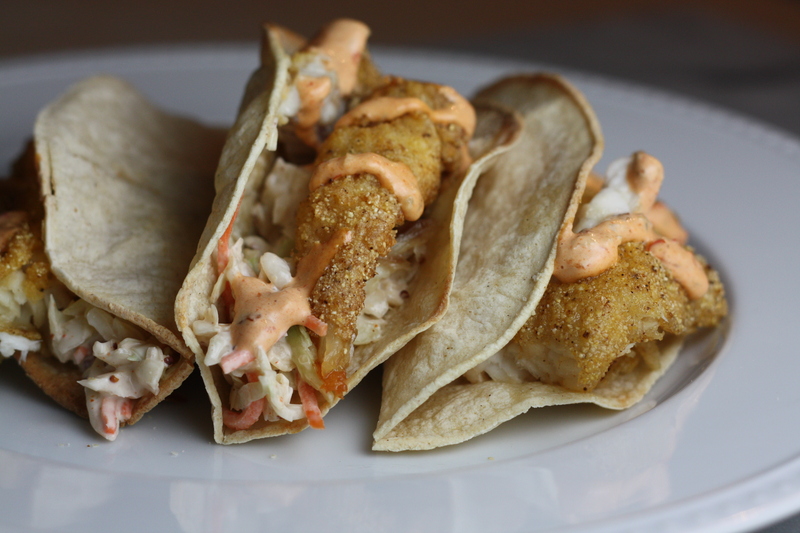 Fill each tortilla with a generous mound of the creole slaw and several chunks of the catfish. Generously drizzle with the chipotle remoulade. Posted in Dressings and Condiments, Food, Main Course, Recipes, Salads, Sauces, Seafood, Vegetable and tagged comfort food, Cooking, easy dinner, Eating, family, fish, Food, kids, life, parenting, Recipes, seafood, travel, vegetables. Bookmark the permalink. i’m sure your kids think their parents are cool! the fish tacos look delicious! These look amazing. I LOVE fish tacos. Glad you posted! 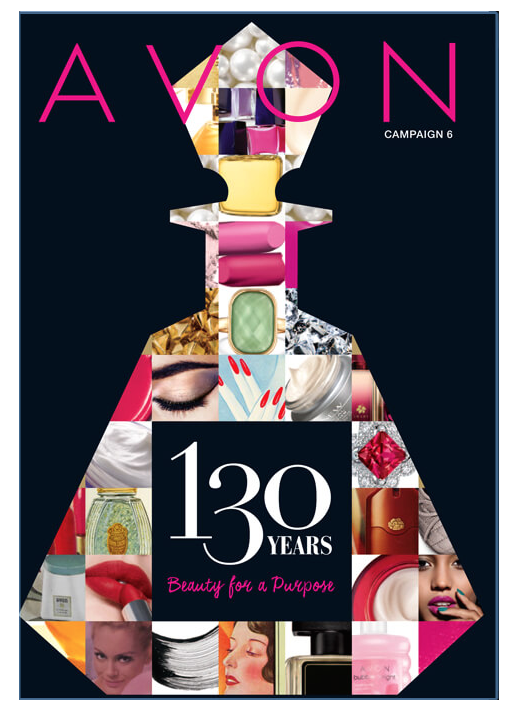 hi there – these look great! 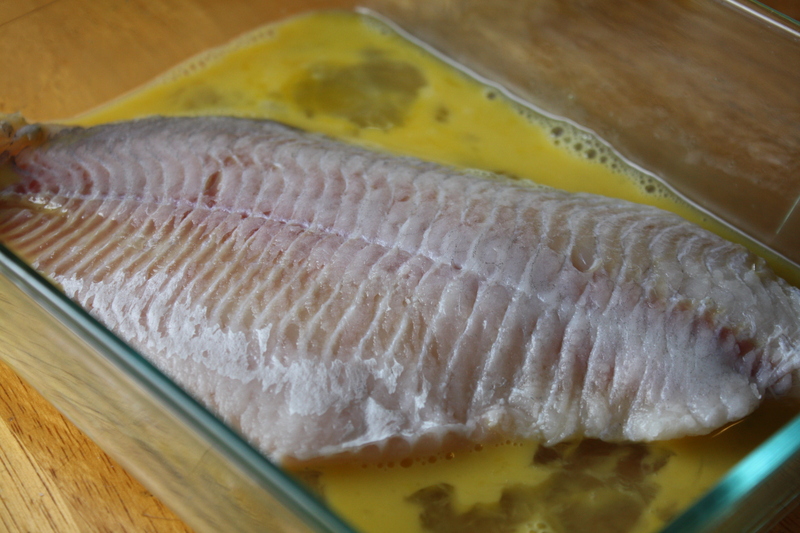 I always have a bag of frozen tilapia in the freezer – ok to use that instead of the catfish? Also, I can totally empathize with the low cool quotient with the kids – enjoyed reading!! Yes, I think the tilapia would be a fine substitute! Enjoy!